Please note that everything in this article applies to humans as well. 100% Relaxation is a state that is absent of all tension, both Necessary and Unnecessary. This state is achieved in a position that requires no use of any muscles whatsoever, such as a completely stretched out prone position. Sweetie demonstrates this in the first photo. No muscle tension is required for the horse to maintain this position. Total Relaxation is a state that is absent of all Unnecessary Tension. Unlike 100% Relaxation, the state of Total Relaxation DOES require the use of the muscles. Necessary Tension in the muscles is required,to one extent or another, in order for the horse to maintain a position, whether stationary or in movement. In the second photo Justy demonstrates the position that requires a very minimal amount of Necessary Tension. 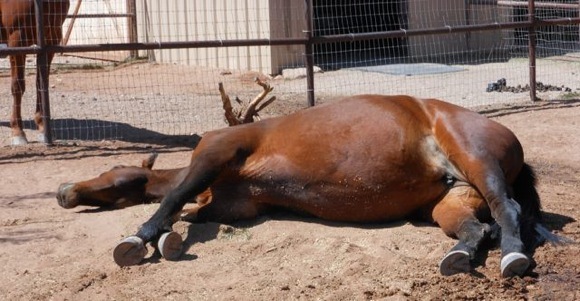 This is why the horse is able to maintain this position for many hours of grazing without becoming tired or sore. Most horses carry quite a bit of Unnecessary Tension tension in their bodies, especially in movement. The more Necessary Tension that is required, the more probability that Unnecessary Tension will come along for the ride, so to speak. Most horse owners are unaware of the amount of Unnecessary Tension that their horses carry, in both mind and body, and just how much this Unnecessary Tension negatively affects their horses’ internal health, the soundness of their musculoskeletal system and their mental/emotional well being. I would like to begin by delving into the benefits of Total Relaxation for the mind and body of the horse, beginning with the mind. When the horse’s mind is Totally Relaxed, it is free of fear, worry, anger, anxiety, frustration, depression and any other negative emotions. This Totally Relaxed state of mind feels good. It is a state of peacefulness, and horses LOVE how peacefulness feels. In addition, the more Totally Relaxed the horse’s mind is, the better her mind will work. When it is Totally Relaxed, the horse’s mind is calm yet energized and aware, has more focus, more clarity, a better ability to absorb and retain information, is quicker to respond to requests, and makes fewer mistakes. It is of great benefit to the human to be interacting with a horse whose mind is Totally Relaxed. Due to the fact that horses are prey animals, the negative emotion they feel most, and most easily, is fear, so usually, all it takes for a horse to slip into a state of Total Relaxation is lack of fear, and this occurs when the horse feels totally safe. This state of mind in the horse is most easily achieved by the horse who has deep trust in the human who is interacting with her. Not just trust that the human will not do anything to hurt her or cause her discomfort, but deep trust that the human will protect her from anything or anyone in her environment that could harm her. As you can see, the benefits of a relaxed mind are numerous. Now I would like to delve into some of the benefits of a relaxed body. This applies to all athletic endeavors, from dancing to football, not just speed sports. It also applies to your horse when she is in movement, and it applies to you when you are riding your horse. 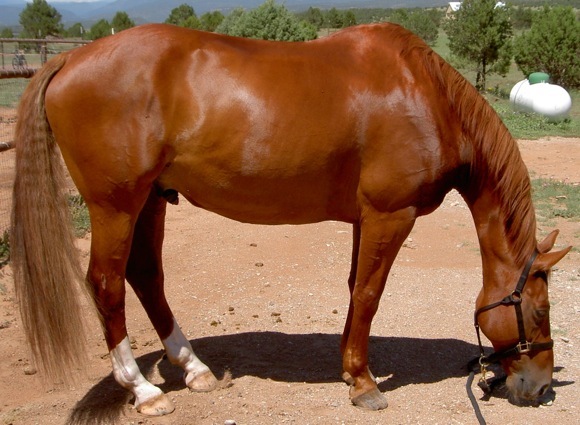 Both horses and humans have a tendency to tense/tighten more muscles than is necessary for the situation. 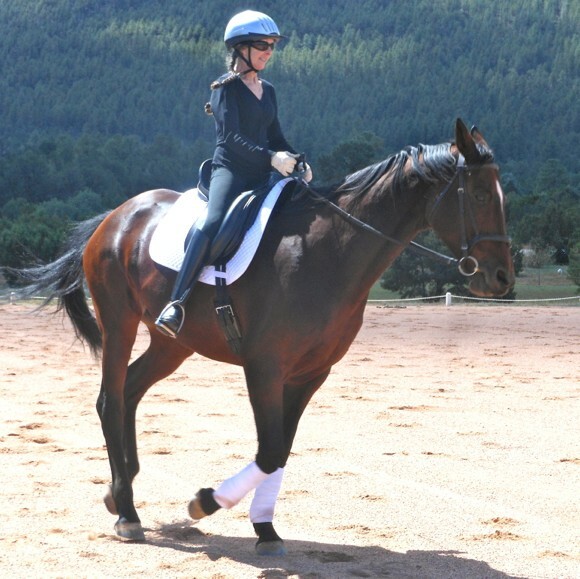 In my last article, The Negative Power of Unnecessary Tension, I added a photo that showed my mare, Sweetie, cantering with me on board, and she was demonstrating a horse holding quite a bit of Unnecessary Tension and a lack of proper Muscle Separation. The photo of her cantering that goes with this article shows her demonstrating Total Relaxation and a use of proper Muscle Separation. It is important to note that Unnecessary Tension exists at three “levels” in the mind and body. First is momentary Unnecessary Tension created as a result of something in the horse’s environment that she feels threatened by in any given moment. Next is recently acquired Unnecessary Tension that was created as a result of something in the horse’s environment in her recent past that she felt threatened by and that she has not been able to let go of and, therefore, has begun to lodge and get “stuck” in her body and mind. Lastly is deep, residual Unnecessary Tension that was created as a result of something in the horse’s environment in past years that she felt threatened by and that she has not been able to let go of. This Unnecessary Tension has not only become lodged and stuck in her body and mind, but over time, it has become buried deeper and deeper in her body and mind. Deep residual Unnecessary Tension creates habits and patterns of mental/emotional reactions and physical posturing that are damaging to the horse. These negative habits and patterns interfere with the horse’s ability to have as happy, healthy and sound a life as possible and also prevent her from reaching her optimum performance potential. While initially these negative habits and patterns are caused by deep, residual Unnecessary Tension, it becomes a negative spiral whereby the habits and patterns also keep the deep, residual Unnecessary Tension lodged and stuck in her body and mind. The deep, residual Unnecessary Tension and the negative habits and patterns serve to cement each other in place. I have studied healing for a lifetime, and my experience has led me to the realization that there are two basic approaches to helping the horse to release Unnecessary Tension in order to promote healing. With Facilitated healing someone or something outside of the horse does something to the horse that causes a release of Unnecessary Tension. Some examples of facilitated healing are the many different types of massage, acupressure, energy work, Reiki, Shiatsu, light therapy and others. With Assisted healing the human does nothing to the horse that causes a release of tension, but instead, merely assists the horse in bringing her focus on and into her own body. The human then stays completely out of the way as the horse seeks out Unnecessary Tension and releases it herself. Another name for this is Self Healing. I have used both approaches, and I have personally found that, while Facilitated healing definitely helps the horse to release Unnecessary Tension and promote healing, the Unnecessary Tension tends to return and must be released again and again. This is most true of deep, residual Unnecessary Tension. I have found that assisted/Self Healing creates a situation whereby the horse is better able to access and permanently release deep residual Unnecessary Tension, sometimes in just one session, but usually over a period of several sessions. In addition, the more the horse experiences Self Healing, the better she gets at it, and she will eventually become adept at releasing Unnecessary Tension on her own without any assistance at all. I have found that Assisted Healing is infinitely more powerful than Facilitated Healing. Both approaches to healing require the next step, which is to assist the horse to replace the mental/emotional and physical negative habits and patterns that are damaging to her with mental/emotional and physical positive habits and patterns that are beneficial to her. This turns the existing negative spiral into a positive one, and the horse’s well being, internal health and physical soundness just keeps on getting BETR and BETR. My next article will address the importance of Proper Alignment and Posturing, both of which cannot be achieved without Total Relaxation.